The iPad being the newest obsession for many will need all of the random accessories that the rest of the Apple products have received. Those of you that like to be around a whole lot of water might want to consider picking up this case. 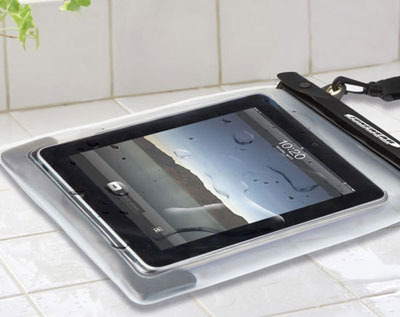 It’ll make sure you have full use of your iPad, but it will also make sure that it stays completely dry. The case even has an incredibly attractive strap that can be used to make the iPad hang from your neck. I’m sure you’ll pick up even potential partners if you hang this around your neck while you’re wearing a bathing suit at your local pool. Of course should you want to make that particular fashion statement, you might have a little bit of a hard time getting one of these since it comes from a Japanese site. If you’re feeling lucky though, it costs about $38.